After creating any necessary tax codes, you will apply them to your company code’s invoicing procedures. Enter US for country and click enter. For tax code, enter xo. 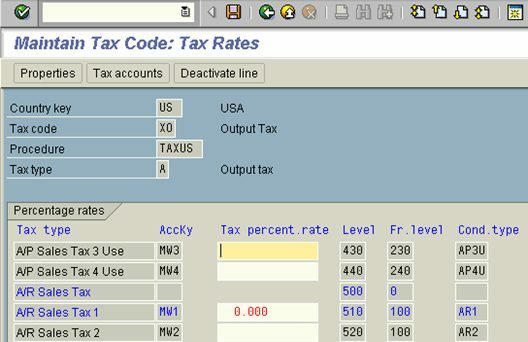 Type “Output Tax” under description. Tax Type is A for output. Click enter. Enter 0 for Accrued, A/R Sales Tax 1, MW1. Click the Tax Accounts button, and check to make sure an account is linked to the tax code. 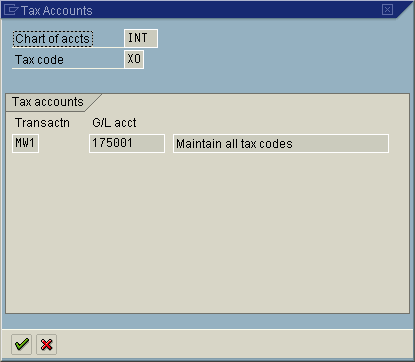 Repeat the above procedure for an Input Tax code xi, with a tax type of V for input tax. You will then choose a tax code from the drop down menu field under Defaults domestic and enter the tax code xi that you just created.